Monday, you’ll learn more about this mysterious, ah, cat girl, and her mysterious feline ways. I officially love the Venusian catgirl with my entire being! LOVE HER! LOVE HER! Her Sylvesterian accent is adorable to boot. Dima sends several cans of sardines on behalf of my characters. A minor thing. In panel number one. In the top Balloon. The word liar ith miththing. Yoiks! Thanks for catching that! All fixed. Sheesh. I need more sleep. A cat-nap would do wonders. I had to read “fitth” twice. Fitth. You know, the kind that thwimth in the othean. Yeth, I undertthand. 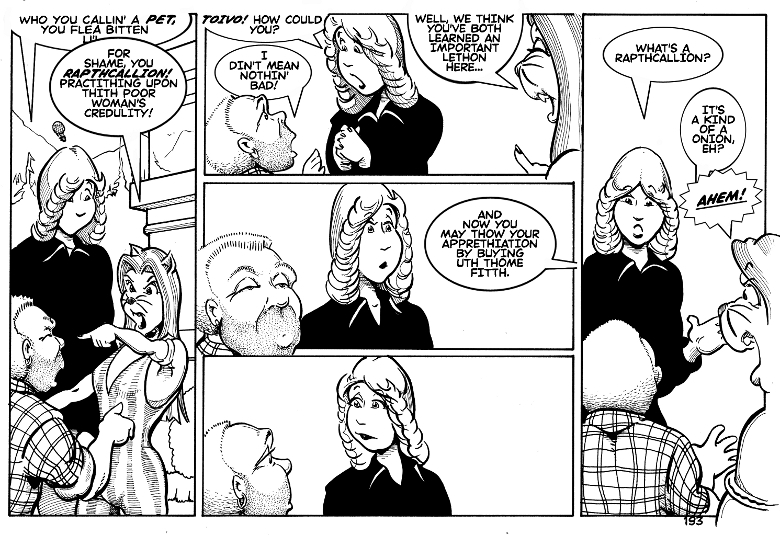 I cannot help but imagine the Venuthian catgirl thtanding withth a thmug look on her fathe off-thcreen in Panel #4. Tharban from Amtor are pretty vicious. Maybe Stephanie doesn’t want to bait one? The expressions in 3 and 4 are priceless. I love the way Stephanie observes the situation with wonderment. Kind of reminds me of my dog when he sees an animal on the tv. Stephanie has that dog-like fatalism that I love. The “I don’t quite know what’s going on, but I’ll cheerfully go along with it” attitude. The Jim Henson puppet…. with a shrunken left arm… and a lisp. Thanks for the brain-jog. Stan Freberg was genius.